This article was originally published on Labour Teachers here. This week Tristram Hunt postulated in the Guardian that a Labour government may look to phase out GCSEs all together. if you didn’t catch the article, have a look here. It’s an interesting article, and I have to say I like some of the things he’s saying. Firstly, he’s ruling out radical quick reform. This is something that has been playing on my mind, after 4 years of Gove’s fast paced reformation I feel we need time to let it embed. We haven’t assessed the new GCSEs or A Levels yet and won’t for a few years, and I feel it is right to let this take place given the work that is already underway. 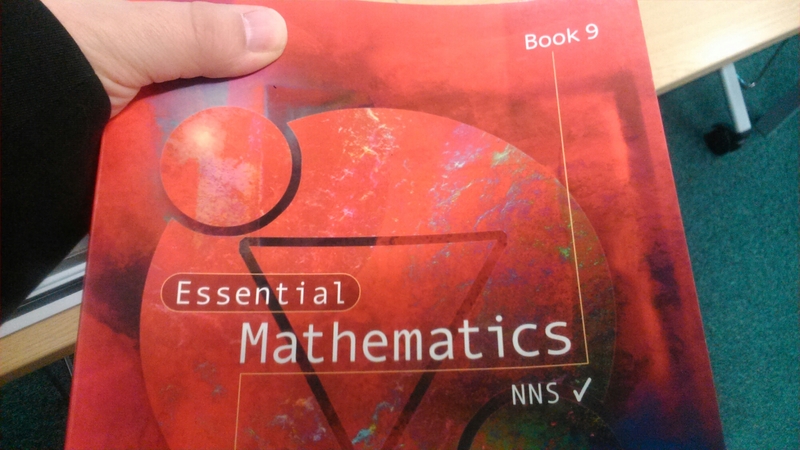 I happen to think the new maths curricula are in fact better than the old ones so am looking forward to teaching the new content. I am happy, though, that there are plans afoot to restore the AS /A level link. The second thing I liked about Tristram’s comments was that he feels there is a wider discussion to be had, and that the education agenda needs to be thought through in a long term manner. This is something Gove never really seemed to think. With him it was reform, reform, reform. Some good, some bad, all fast. It felt like consultations were being hidden because they were being done over the six week summer holidays where many involved in education are refreshing themselves ahead of the new academic year. Tristram seems committed to taking views from all stakeholders and working with the sector, rather than imposing on it. Finally, there is the proposal itself. An end to the current model and a total overhaul of everything we know! It’s a scary prospect, but also an exciting one. I’ve written before about vocational education and our repeated failure, as a nation, to get it right. Maybe this is how we can. Instead of single subjects the suggestion is that students would leave with a baccalaureate. This could be academic or vocational and both would be equivalent. The ins and outs aren’t fleshed out in the article, but I would envision a core section (possibly covering the old “three Rs”, basic history, hopefully some political education) and then a wide selection of options. I believe other countries run similar types of programmes. I’d imagine it gives a lot of scope for choice. I do have reservations though, and I would certainly need more information before I could definitely say I agreed with the proposal. It’s unclear when students would sit it. We’ve seen a requirement introduced for young people to be in education or training up until 18, but if the baccalaureate was assessed at 18 would those choosing apprenticeships and the such from 16 leave school with nothing? Would study towards a baccalaureate be a requirement for said apprenticeships? Or would young people need to stay in school until 18? What exactly would the baccalaureate look like? How would we ensure the technical baccalaureate and the academic one hold the same footing? All in all, an interesting development that opens a much wider conversation. What do you think about these proposals? Do you think this could be the way forward, or would you prefer to keep the system as is? I’d love to know! The numbers 2,3,12,14,15,20 and 21 may be divided into two sets so that the product of the numbers in each set is equal. What is that product? I had saved this over a year ago, and cannot remember where I got it from, but I can see why. It’s a lovely little question that I intend to use as a starter next week and see how my classes get on. Before you read on have a go at it yourself. Go on, you know you want to…….. Right, good, now you can see if I went about it the same way! My first thought was that all the fun could be taken out of this by using a calculator, typing all the numbers in and pressing square root. 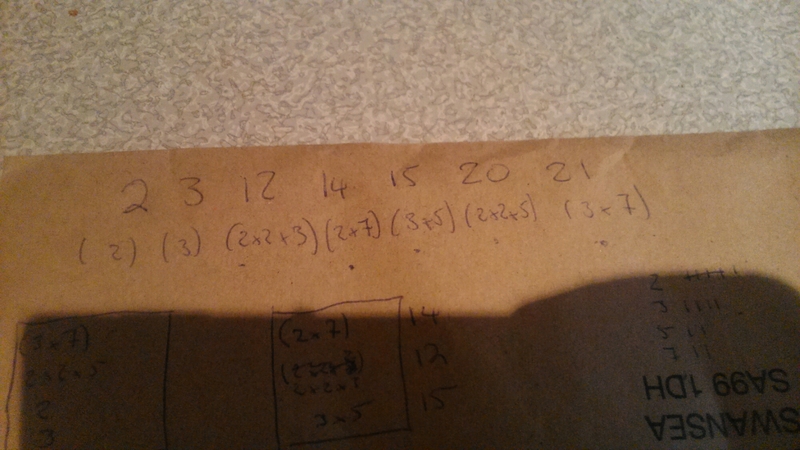 So when I set it I will be adding the line “and which numbers are in each set”, and this is what I set out to find. 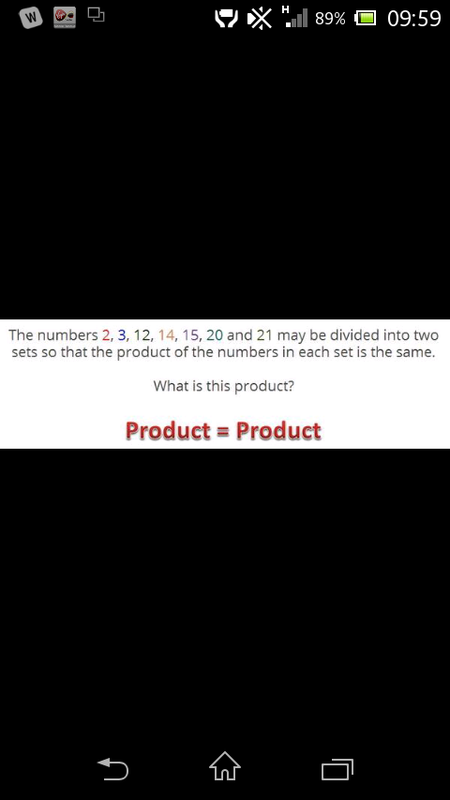 From this I knew that the product must be 2x2x2x3x3x5x7 which is 2520. This, of course, answers the original question but I wanted each set. 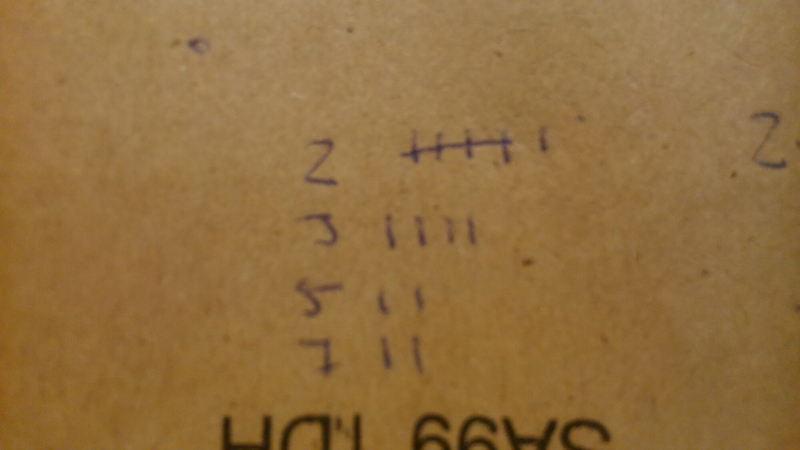 I looked at the numbers and the first think I noticed was tgat 14 and 21 had to be in separate sets, as they had 7 as a factor. 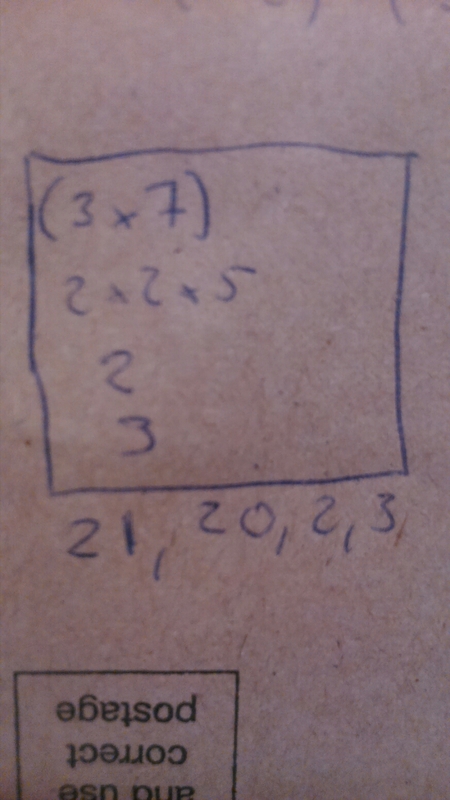 I also needed to split 15 and 20, my intuition suggested that 20 and 21 should be in separate boxes, but it was easy to spot that the 2s and 3s, wouldn’t work out so I placed them together and fit the rest on around them. A nice little puzzle, I wonder how my classes will find it. 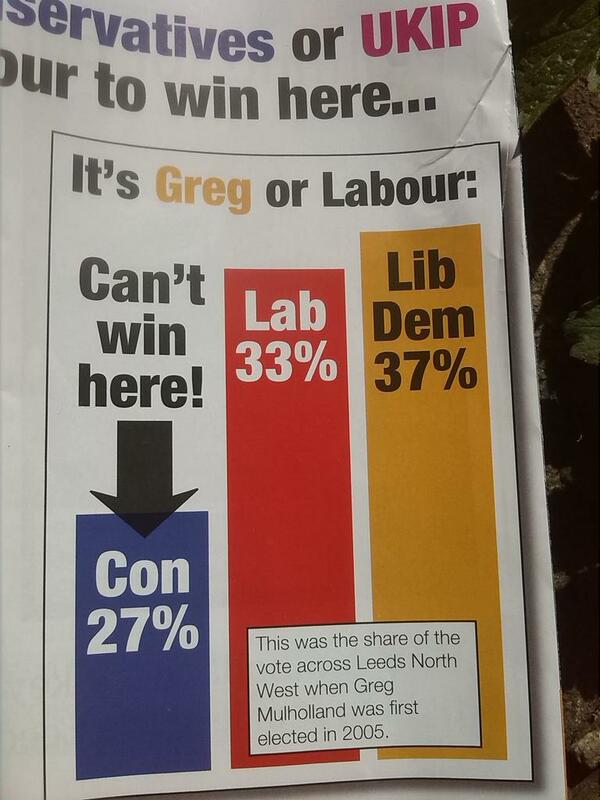 It’s election time again, and we all know what that means….. BAD GRAPHS!!!! Last year, in the run up to the locals, we had some classics and this time is no different. 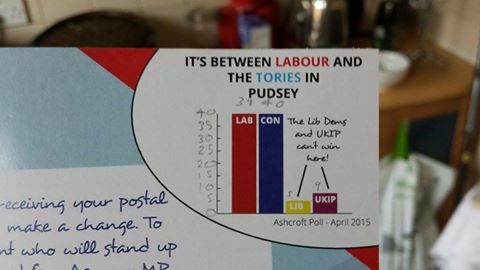 Amazing isn’t, despite the fact that he’s running for parliament, Jamie Hanley (@jamiehanley) – Labour candidate Pudsey, has managed to buck the trend and include a fully correct bar chart!! Dave Gale (@reflectivemaths) did point out that technically the claim “Can’t win here” is invalid, and should in fact read “statistically extremely unlikely to win here” or something similar. 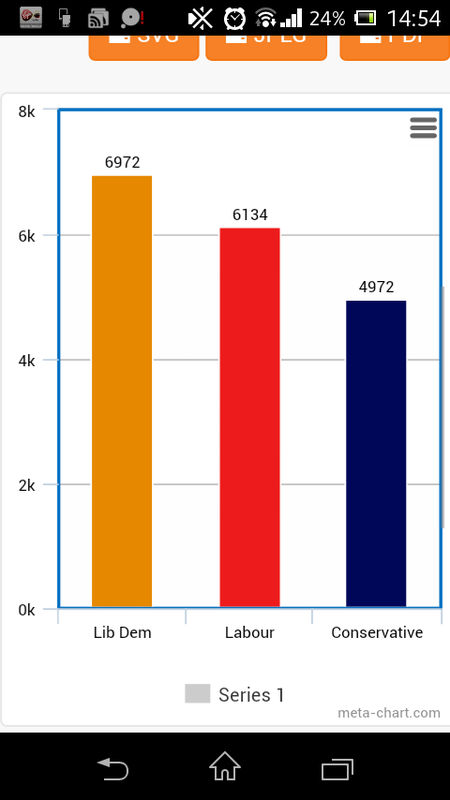 But that doesn’t take away from the excellent bar chart. These two came through my door, both from Greg Mulholland (@gregmulholland1) the Liberal Democrat defending the constituency. 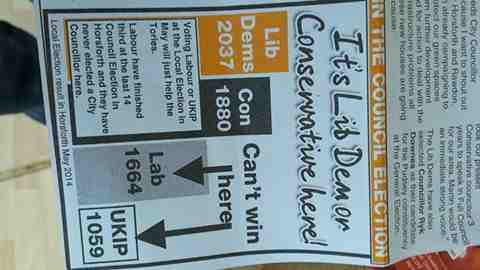 The first error, I’m sure you’ll notice, is that the numbers are different on both leaflets despite them claiming to be from the same set of election results! 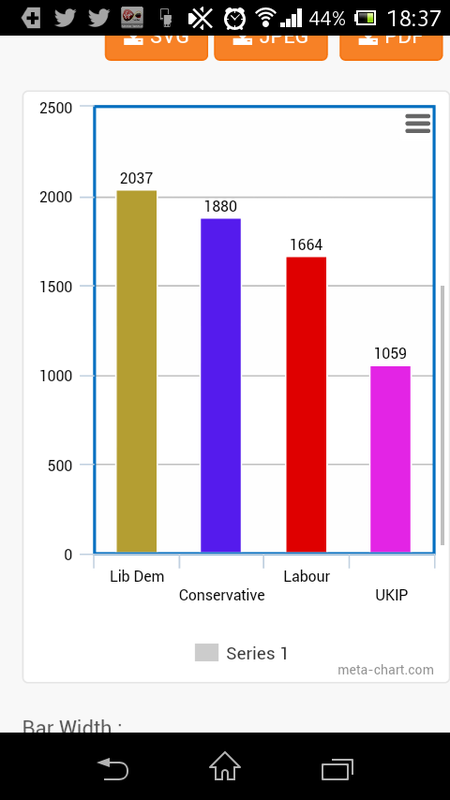 The second error is that the tiny gap between the Lib Dem and the Labour bars is supposed to signify around 700 people (on one, 800 on the other!) 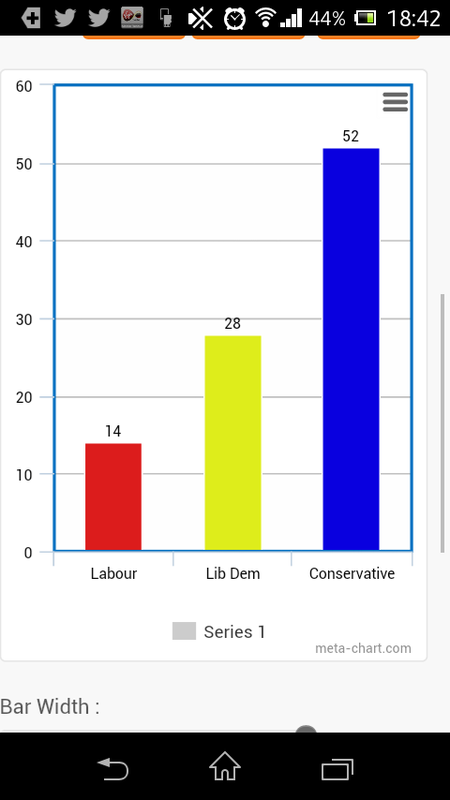 and that massive gap between the Labour and Conservative bars is supposed to be 1200 on the top and 1600 on the bottom. 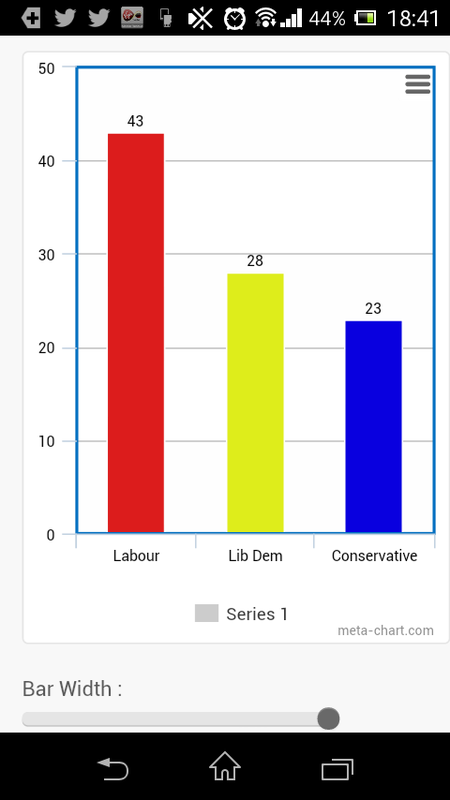 So the biggest it should be is twice the gap between Lib Dems and Labour, as you can see it is considerably more than this. 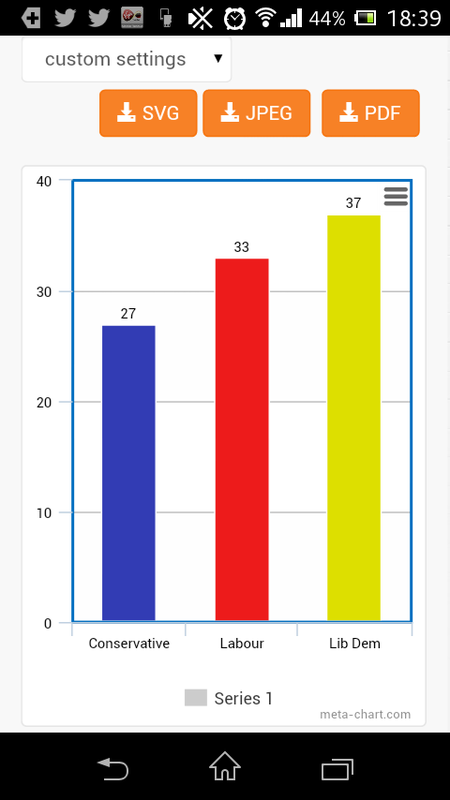 The third error is that the aforementioned gaps between the Labour and the Conservative bars is supposed to signify between one third and one fifth of the total size of the Conservative bar, but as you can see it is actually considerably bigger on both bars. 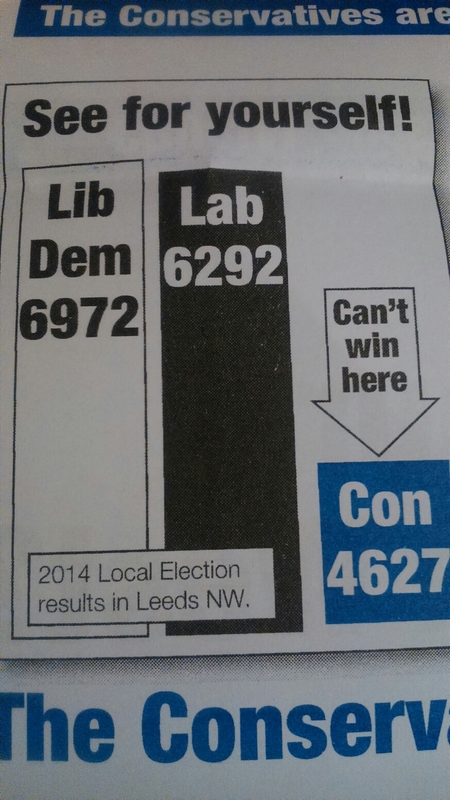 The final error is the one Dave mentioned above, the claim “Can’t win here” is technically wrong. If one of my pupils turned this in I’d be fuming! As I’ve been writing this post I’ve just received this link to this crime against statistics! 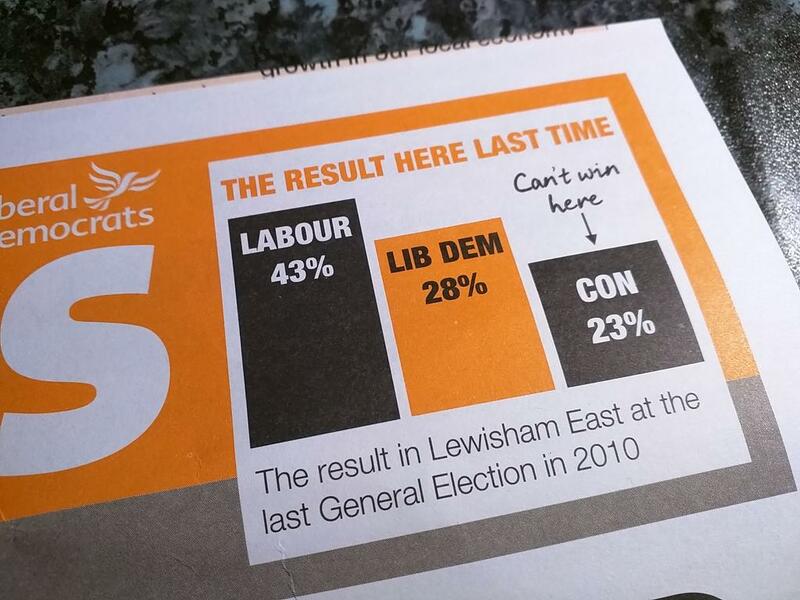 While writing this post I asked people to send me any bar chart crimes that had come through their doors on election material, I particularly asked for non Lib Dem ones, yet the masses that came in all seemed to be theirs. 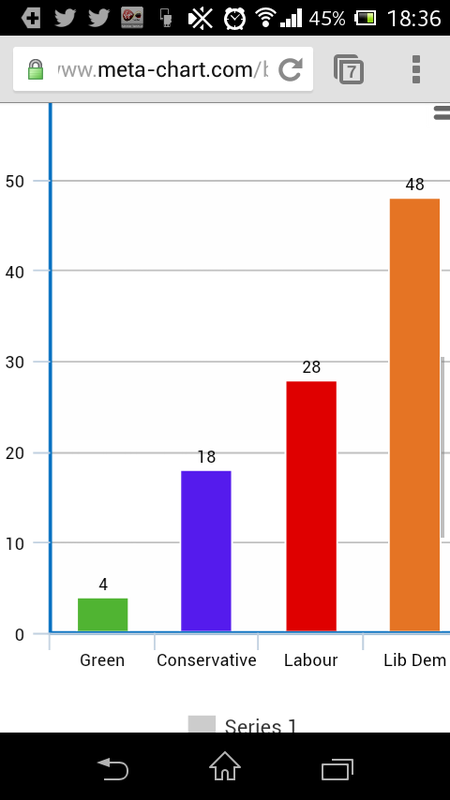 I am beginning to worry that no one in one of the parties that has held government office for the last 5 years can grasp a basic bar chart. I’d be seriously worried if year sevens were making these mistakes. 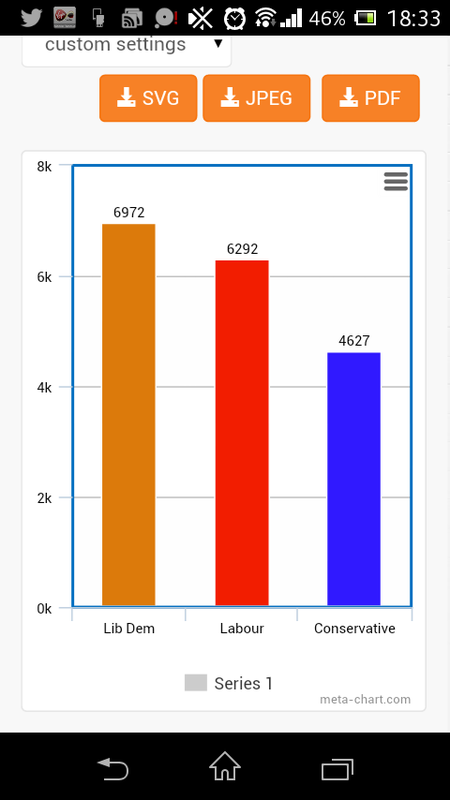 What’s worse is that there are tons of free websites that will do it for you, I used meta-chart for these. 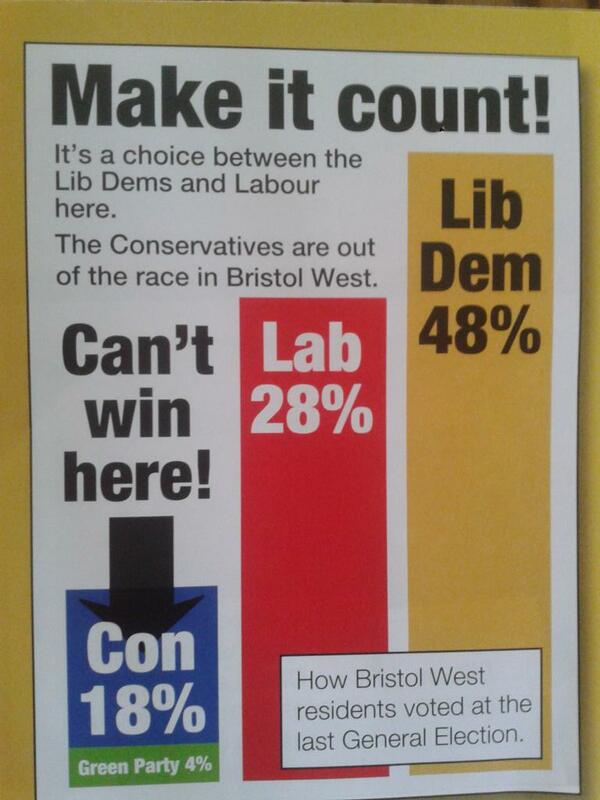 Or perhaps it’s just their policy to use misleading bar charts on their flyers. I am always on the lookout for crimes against statistics, so please do send me any you find, be they election related or not. Monday is the last day you can register to vote, which means I have spent a large portion of the week checking in with my year 13 class and my year 13 form group that they have registered. This has led to various discussions around politics, how they can decide who to vote for etc. It seems a lot of young people take on the political views of their parents. I was pleased to hear a number of them had actually downloaded the manifestos of the major parties and we’re using them to help them decide. I was shocked, however, at how many of them knew very little about any of it. One asked if she could vote for Barack Obama. One asked if we were choosing a new queen. One thought Ed Miliband was the prime minister at the moment. There were many others like this and they echoed conversations I’ve had in previous years too. When one young lady asked who I thought our next president would be another year 13 overheard and joined the conversation. He was very knowledgeable about the political spectrum and the democratic process and it was quite refreshing to hear him explain the ins and outs of it rather than having to explain it myself. I don’t have an answer. I don’t know much about citizenship, but I thought that this was something that fell under that banner. The current provision clearly isn’t helping engage young people with the process and it clearly isn’t helping to enhance their understanding of politics. I am a firm believer that we need to be giving our learners the knowledge they need to make these decisions, and that means we need to increase this aspect of their education. Maybe the citizenship curriculum is too wide and/or the time allocated is too small meaning teachers cannot give each topic the time it deserves? Maybe it’s not seen as important by schools because it doesn’t fall into the same category of core subjects as others? Perhaps if it were made a requirement that all students study it to GCSE and it were given double weighting on progress 8 similarly to English and maths then it would be seen as more important by schools? Perhaps it needs a revised curriculum and a rebranding? Perhaps it suits the political classes to keep the majority uneducated on politics and it’s importance? One thing is for sure, there are far too many people leaving school without a sound knowledge of these matters. 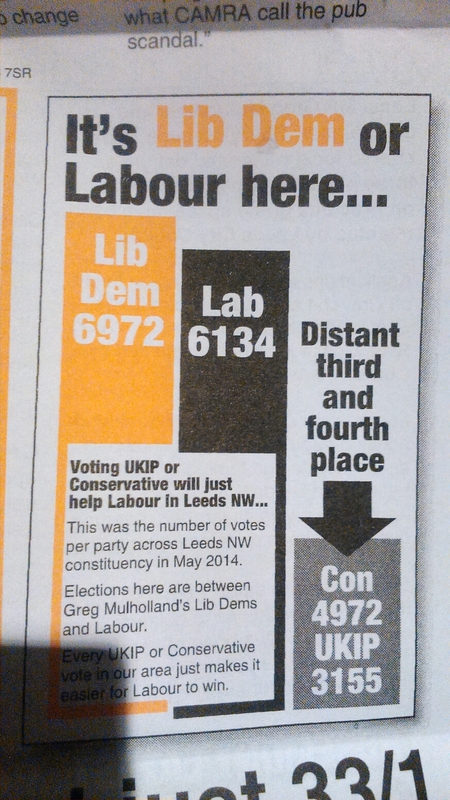 Wherever I see incorrect maths, it annoys me, whether it be in election material, newspapers or anywhere else. But the place where it annoys me most is the maths classroom. I don’t mean students getting the answers wrong, that’s an invaluable part of the learning experience. What I mean is when teachers get it wrong. This happens more than people would expect. 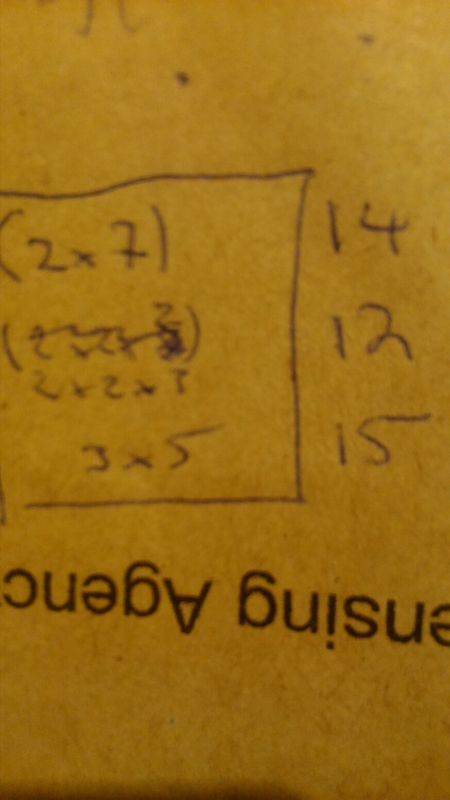 I’ve written before about people teaching things wrong (ie rounding or the order of operations) but today is want to discuss a different annoyance. It’s from a resource I downloaded from the TES website. The resource itself was pretty good, but this was one of a number of questions that infuriated me. Have you noticed why? Take another look. Yes, indeed. 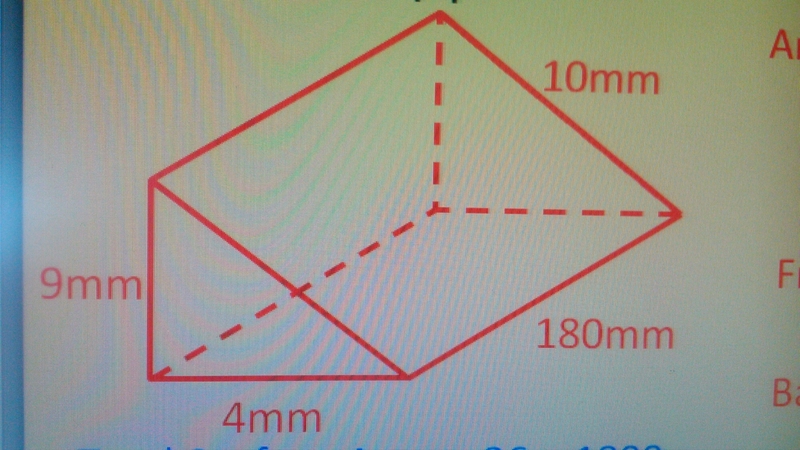 The right angled triangle that forms the cross section of this triangular prism is that well known Pythagorean Triple the “4,9,10” triangle. Never heard of it? Neither have I! That’s because 4^2=16, 9^2=81 and 10^2=100. And 16+81 is very definitely 97, which in turn is very definitely NOT 100. It’s not even as though it’s hard to generate triples! This sort of thing is lazy, if it had been put in front of me, as a student I’d have called a teacher out on it. The first time I saw something like this was during a micro teaching assignment while on my PGCE. The person in that case was rusty! I’ve seen it a couple of times with trainees or NQTs during observations, again these can be excused. I even realise that experienced teachers can make innocent mistakes, but please, please, please check these things. 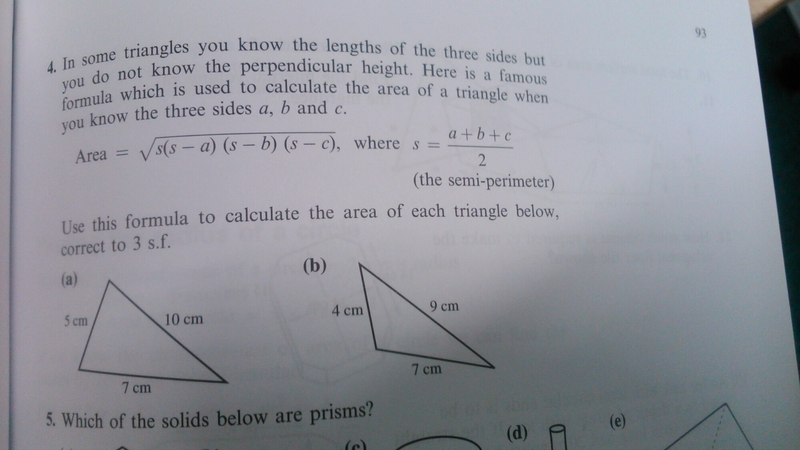 Especially for triangular prisms, as this is THE area that I see this happening again, and again and again. Have you encountered something like this? Do you get as angry as me about it? Do you think it doesn’t matter and I’m being overly pedantic on this? Please let me know. 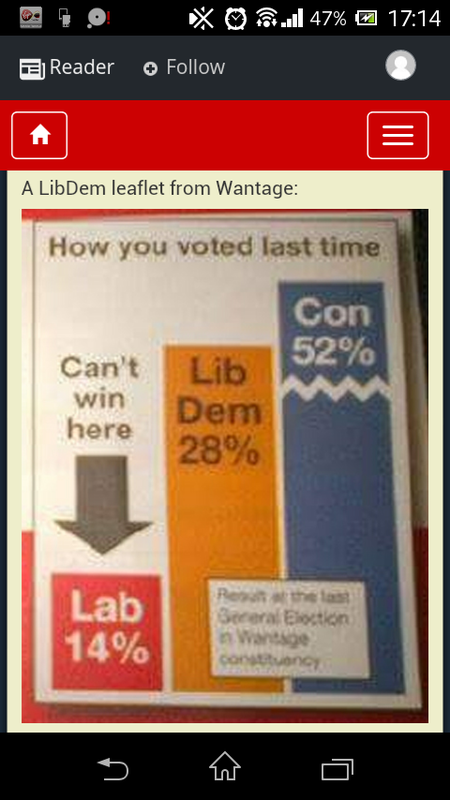 This was the week they came, the manifestos. I’ve been waiting for them in anticipation and it was beginning to feel they’d never come. I love manifesto season and I’ve started to read and digest them. One thing that jumped out at me in the Labour manifesto was a renewed commitment to vocational educational. Vocational Education is something that has been on the fringes of education policy in the UK for a long time, but we haven’t ever managed to get it right. One of the first things he spoke of was the 1963 Newsom Report “Half our future”. He went into great detail about the report, and the first thing I did when I got home was download it and read it myself. It is a very interesting piece which sets out many aims for Education Policy that have only recently cone to fruition, and some that are still vastly needed. This year’s Labour manifesto speaks of the “50% of young people who don’t want to go down the traditional academic route,” this is the same “forgotten 50%” Geoff referred to and the “Half our future” that the Newsom Report wanted to improve outcomes for. We were getting it wrong for these people in 1963 and we’re still getting it wrong now. The manifesto outlines a hope that a full route from school to employment can be created, higher investment into vocational education at FE and HE. Technical colleges and technical degrees which can be done in conjunction with work places. One would hope these would have the rigour of their academic counterparts and would increase the technical expertise in the British workforce. The last labour government did a lot of good for education, but didn’t quite get it right with vocational education. People were pushed into academia when they didn’t want to be or weren’t suited to it. The vocational courses pushed were often seen as inferior to their equivalents and there was no real rigour in them. Ideas of students blindly copying off the board and receiving good passes were rife and often near the mark. This meant that students were leaving with handfuls of qualifications that didn’t really mean much. The diploma was,another decent idea that was a failure in its implementation. Instead of inferior qualifications, what we need is real, rigorous, vocational qualifications that require actual hard work and skill to achieve. For this type of education to be a success we need to create better links with the employers, more rigour in the qualifications and bring in other aspects but in a setting that is more relevant to the workplace. The qualifications need to be worth something and they need to hold the same footing as their academic counterparts. We need to get away from the stigma of vocational qualifications being for those who “can’t” do the academic stuff, and move to a view that actually its just as important to have a highly skilled technical workforce in place in this country. The manifesto looks like steps are being taken to ensure that this time things work out right. Let’s hope enough time and money is included to ensure it does, and let’s cross our fingers that it isn’t another nice idea that fails to deliver.